Yet while “The U” was sprawling and imperfect, it was also much more willing to take a wide view, analyzing Miami’s wrongdoing, what they did and why, and what it wrought, for bad and for good. Aaron Rahsaan Thomas’s “Trojan War”, on the other hand, epitomizing Hollywood, which is represented by legendary producer Larry Turman who turns up as something of an all-purpose narrator, is much more content to declare “nothing to see here”, to focus on the good more than the bad, and stick to the field rather than the myriad of skeletons in the closet. “Trojan War” isn’t much more than a hagiographic highlight reel. Granted, there are a number of incredible highlights from this period of USC Football. The program had three players take home Heisman Trophies while the team earned a cavalcade of conference titles and a couple national championships. The doc spends a good chunk of its time re-living these moments through footage of so many games and talking heads waking up the echoes. 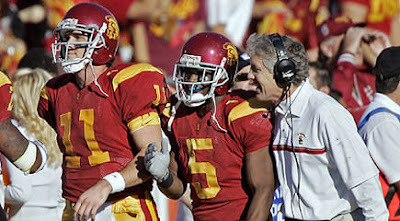 Nearly everyone is accounted for, from quarterback Matt Leinart to running back Lendale White to coach Pete Carroll. Everyone, that is, except for running back Reggie Bush, the man who won college football’s highest honor in 2005 and whose extra-curricular activities involving gifts worth a shitload of money that the NCAA frowns upon because it prefers no one earns money but itself unleashed the program’s downfall. Perhaps his being MIA from the doc is poetically apropos; after all, in lieu of these NCAA violations wins during the Bush era have been “vacated” and his Heisman Trophy given back, officially suggesting he did not “win it” (even though he still very much officially did this). Others, though, were very much at fault, including Carroll, whose wide open practices, fawned over by the media then and now, very much created a culture where the people who approached Reggie Bush could approach Reggie Bush. This is pointed out, sort of, but hardly scrutinized, and even though Carroll is on camera repeatedly, he is never pressed about it, dodging the fray yet again just as he did when he got out of town ahead of the NCAA posse for the NFL. The majority of what led to NCAA sanction-era football at USC, however, is back-loaded, tagged on at the ending as if for no other reason then it’s required. And yet...in this deliberate narrative oversight emerges the film’s most polarizing contention. It becomes clear in the “So What?” tone players and coaches and program ambassadors and fans take toward the wrongs done that they would not do nor wish anything would be done differently; that they would not go back in time and spruce up their reputation; that they would continue flouting the rules to maintain their memorable reign. It’s admirable in its honesty. This is college football. Winning really is all that matters.